E-commerce is a growing feature of the world economy. Customers / potential customers, use e-commerce every time they search for products and purchase products, on the internet. Companies and businesses regularly use ‘e-commerce’, to exchange documents and for data communication between computer systems. E-commerce is a general term, that refers to the use of ICT systems by a business / company and customers. An example of e-commerce is seen below. A customer orders a product over the internet and pays using a credit / debit card. 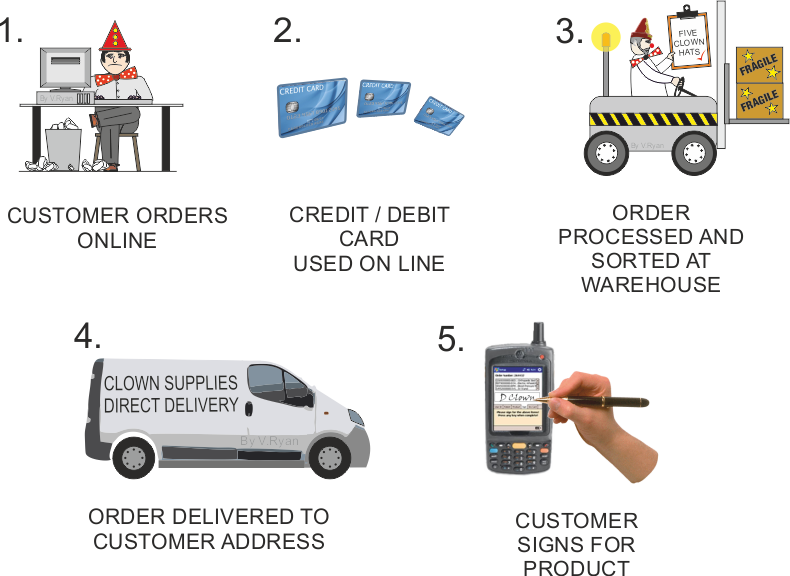 The payment / order is processed electronically and the product is dispatched from the warehouse. Finally it is delivered direct to the customer’s home and the customer signs for it. 1. Shopping online can be carried out twenty four hours a day, everyday of the year. 2. Online shopping can take place at home, without the need to travel to shops. Potentially, this is ecologically sound / environmentally friendly, as it saves on fuel and reduces congestion on the roads. 3. A products features and functions are often listed in detail, on retail websites. 4. The potential customer can shop when it is convenient for him / her. 5. It is often easier to compare products using internet sites, review sites and forums. This may lead to a more informed decision, regarding buying a product. 6. Shopping online usually does not require the customer to interact with shop assistants and other customers (this could be regarded as a disadvantage). 7. Precise searches can be made online, helping the customer to find the right product. 8. E-commerce deals with credit and debit cards and does not require the customer to have cash in hand. 9. Disabled people with mobility problems, can shop from home and do not need to visit a retail outlet. 10. Shopping by e-commerce is fast. Time saved by shopping online, can be used in other more productive ways. 1. A potential customer only sees an image (sometimes a 360 degree image). He / she cannot handle the product. 2. Images of products are usually taken from favourable angles, with the best possible lighting conditions. The potential customer only sees what the manufacturer / retailer wants him / her to see. 3. A shop assistant is not available to question, which means answers to queries / questions are not immediate. 4. Returning a product is often more complicated and may involve parcelling it and taking it to a post office. This may be at the customers own expense. 5. Potential customers must be wary of online fraud and take the appropriate security measures.